National Museum has a good collection of Khmer sculptures dating from the pre-Angkor period (4th century) to post-Ankgor period (14th century). National Museum, built of red bricks by the French in 1917 in a pseudo-Khmer style, is built around a courtyard. 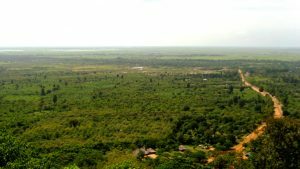 A stone’s throw away from the Tonle Sap is the royal Palace built on the site of the Banteay Kev, a citadel built in 1813. 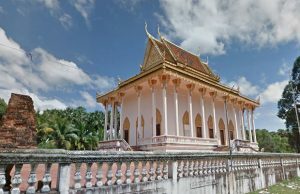 The Palace grounds contain several buildings: the Throne Room of Prasat Tevea Vinichhay which is used for the coronation of kings, official receptions and traditional ceremonies, the Chan Chhaya Pavilion which is a venue for dance performances, the king’s official residence called the Khemarin, the Napoleon Pavilion and the spectacular Silver Pagoda. This pagoda is worth exploring. It owes its name to the 5,000 silver tiles weighing 1kg each which cover the entire floor. 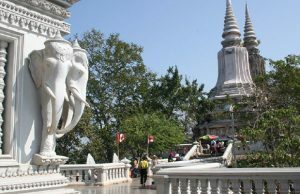 The emerald Buddha sits on a pedestal high atop the dias. In front of the dias stands a life-size Buddha made of solid gold and weighs 75kg. It is decked with precious gems including diamonds, the largest of which is 25 carats. Also on display at the sides are the coronation apparel and numerous miniatures Buddha in gold and silver. 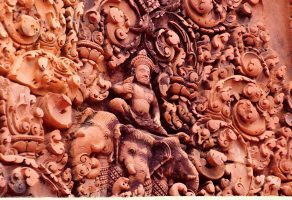 The walls surrounding the compound which is the oldest part of the palace are covered with frescos depicting scenes from the Khmer version of the Ramayana. A visit to the markets and market halls is a must as they give an opportunity to be acquainted with the country's local produce and also to buy textiles, antiques gold and silver jeweler. The four wings of the yellow colored Central Market are teeming with numerous stalls selling gold and silver jeweler, antique coins, clothing, clocks, flowers, food, fabrics, shoes and luggage. For some good paintings or if you prefer antiques, head from the Tuol Tom Poong Market also known as the Russian Market. A word of caution though: you need to sharpen your bargaining skills as the prices here can be outrageously high. National Museum is open daily from 8.00am to 11.30am and from 2.30pm to 5.00pm. French and English spoken guides are available, or visitor can purchase one of the books or pamphlets available and wander the four courtyards, each facing out into a garden, and try to piece together the complex history through these magnificent work of ancient art themselves.